I’m feeling a little nostalgic tonight. 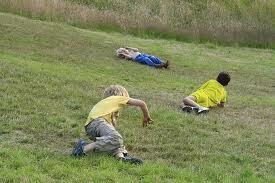 I just finished watching a movie, and in one scene there were three kids running downhill as fast as they could. I started to think of other times that gravity played a role and inflicted pain during my life. Who can forget rolling down a large grassy slope, spinning helplessly out of control and eventually coming to an abrupt stop against a rock or a fence post. Sometimes if you were lucky you would smash into your buddy. Good times. I can remember one time when I thought that riding my bike down what can only be described as a cliff seemed like a great idea. I started down and felt the wind rush through my hair (it was much longer in those days), the bike bouncing down the near vertical slope, the terror combined with exhilaration and the stunned disbelief when I miraculously regained the horizontal. The success was tempered with failure as I came to a rather painful stop in some dense bushes. Well, at least it wasn’t a fence. Good times. 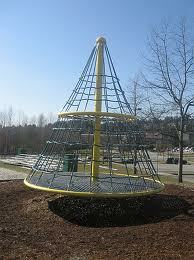 Do you remember those playground merry-go-rounds? I’m not sure if it was gravity or centrifugal force that caused the bruises, scrapes, and dizziness. It would start out innocently enough with you running in circles pushing until you got to the point where you couldn’t keep up with it and at the last moment you would jump on. Of course you are exhausted and have virtually no strength left, so you could feel the inevitable pull and your fingers slipping. You try to drag your foot on the ground, but are unable to find it. Don’t worry, you will find the ground soon enough! Dizzy, dusty, scraped and battered you assess what went wrong and eventually figure out that it was the running that was the culprit. You get your older brother to do the pushing, while you sit back and watch the world spin by. This is the same sadistic brother that tied you up during the hottest day of the year and covered you with electric blankets and left you for and hour. How could this go wrong? I know I fell off eventually and puked my guts out, but everything was a blur. Quite literally! Good times. Flash forward a number of years and I found a variation of this device in Cranbrook BC while on a family vacation. 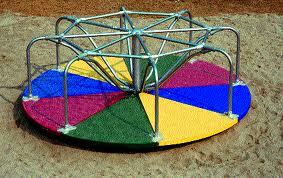 I saw this and started to tell the kids what fun I had on one of these when I was a kid. Louise looked at me with a quizzical look on her face. I imagine she was having a more accurate memory than I and couldn’t reconcile her memory with mine. The kids just didn’t get it! Can you imagine an adult having to show kids how to have fun? I got it spinning faster and faster and jumped at the last moment. Turns out that the heavier you are the harder it is to hang on. I am pretty sure only one rib was broken and the other two were just cracked. The kids still ask me to show them how to have fun. Now my grandson is asking me how to have fun. Kids can be cruel! Good times. 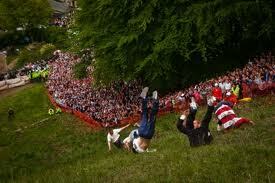 I loved tobogganing when I was a kid. My dad would wax up the bottom so that we would have a great time. I am pretty sure he loved us but he used the snow as a life lesson of sorts. He also encouraged us to ask Santa for a “Flying Saucer” at Christmas one year. What kind of sick mind comes up with a toy to be used spinning and sliding down a hill of ice and is impossible to steer? To top it off there are hundreds of other kids doing the same thing with predictably disastrous results. My buddy was the first one of us to lose an adult tooth. Pretty cool, and the red looked nice on the snow. Good times.